Changing culture is always hard. Ask any CEO. Replacing culture is a lot easier. Ask any intern. After observing that most visitors to MOMA and the Met hated their audio headphones–bad information, interrupted socializing and annoying technology–a group of students from Parsons decided to re-design the experience. 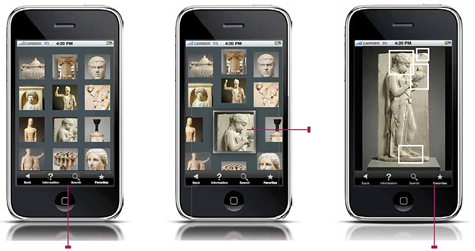 They created a prototype iPhone app called The Museum: A New Social Experience, combining exhibition images, detailed information about the works, links to expert video conversations and consumer comments. Use it while you’re there, share it with your friends, and return to the exhibition forever after. The 19, 20 and 21-year-olds designed a better learning experience than a generation of museum designers. My thought? If they could only be empowered to design a new university…. A month before, I saw another student group design an SMS-based drug inventory system for African villages that gave local people power over far-away bureaucrats and politicians. For the first time, they had the information and the platform to pull into their villages life-saving HIV drugs. My thought? If they could only design a new health system…. So here’s a radical thought: Let’s push the Boomers off the stage of power, skip the Xers who still don’t get it, and go directly to the one generation with the tools, the ambition and the capability to remake the US and reverse its global decline. Let’s empower Gen Y now. This move is more rational that it might seem for two reasons. First, we are all deeply, truly screwed. John Seeley Brown calls it a unique historical moment of constant, cascading change. Each of us in every job in every industry is living a life of institutional meltdown and career shift. I left media as it demassed and disintegrated, and became part of the education system just as it too begins to demass and disintegrate. Health? Business? The same. Social media technology, the rise and fall of nations, global urbanization and warming are rocking everyone’s world. Navigating through this new uncertainty, creating new pathways to economic growth and designing new, meaningful careers is the big challenge ahead for us individually and as a nation. Second, Gen Y is the first generation steeped in Design Thinking, the paradigm that can guide us through these treacherous times. Gen Y is a Search-Learn-Share-Make demographic cohort. Thank Apple, Google, Facebook and Title IX (women’s sports). Gen Y was born into the culture of innovation and has internalized its ritualized behavior and belief system. It’s normal for Gen Yers to go into unknown spaces and search for understanding and answers. It’s normal for Gen Yers to generate new options, play with them, make them better or discard them. They have been creating new identities and play-acting “what ifs” online for years. They’ve been disaggregating and remixing music and images into something new all their lives. Gen Yers know how to visualize data, stuff and experiences. They grew up on “their” platform, Facebook, collaborating and networking. Unlike Boomers who are immigrants to social media technology and have to force themselves into innovative behaviors, Gen Yers do it naturally. And much, much better. Plus, Gen Yers have the right values. They are serious, ambitious and socially conscious. They do give a damn. Working for the Acumen Fund or the Gates Foundation or Teach for America is a big priority for this generation. There were 46,000 applicants from graduating seniors for Teach for America jobs in 2010–8% of the senior classes of Princeton and Wellesley. It’s part of their CV. Sustainability is a given, not a choice. The big surprise is that the same social forces that forced design to evolve into Design Thinking have transformed an entire generation. Millions of people now have the tools and behaviors to design a better society. America has birthed a new “as if…” generation ready, able and perfectly willing to create something new. We need something new, especially in Corporate America. The current generation of boomer CEOs and top managers has done a dismal job over the past decade. Strip away the massive debt, the house asset bubble and tax cuts for the top 5% and the US has generated zero private income growth per capita over the past 10 years. It has been a lost decade, just like Japan’s, without anyone really admitting it. Sure the Xers will whine but they will follow (they always do). I talked at the recent DMI conference in San Francisco, and the theme was Rethinking the Future of Design. For most of the first day, the conversation was about how designers needed to learn the language and culture of business to make managers understand the power of innovation. It was the same conversation I heard a decade ago. The same two dozen company CEOs “get it,” plus a few new ones, and the rest still don’t. It’s really time for this failed generation to get off the stage. The Boomers can’t solve the problems created by their own destructive consumption, individual narcissism, technological immaturity and managerial incompetence. But they can use their residual institutional authority to move aside, skip a generation and empower Gen Yers directly. Instead of Gen Y playing the role of intern to the Boomers, flip it. Sure the Xers will whine but they will follow (they always do). And deep down, they’ll feel relieved of the burden of responsibility and embrace the irony of their losing out (once again). Forget twenty-somethings teaching social media to Boomers. Instead, have the Boomers teach the art of authority and the context of competition to Gen Yers. Take a year, take two, to co-lead, co-create, collaborate and cohabit positions of power. Then leave. If we can flip the generations in corporations, cities, politics and the military, it will revive American society in one smart move.